Record borrowing by investors to buy shares is "worrying sign". “‘Margin debt’ is the term used to describe money investors borrow from their stockbroker in order to buy shares. Naturally enough, when people feel bearish about markets, they tend not to borrow anything while, by the same token, the more bullish they feel the more they are inclined to borrow. 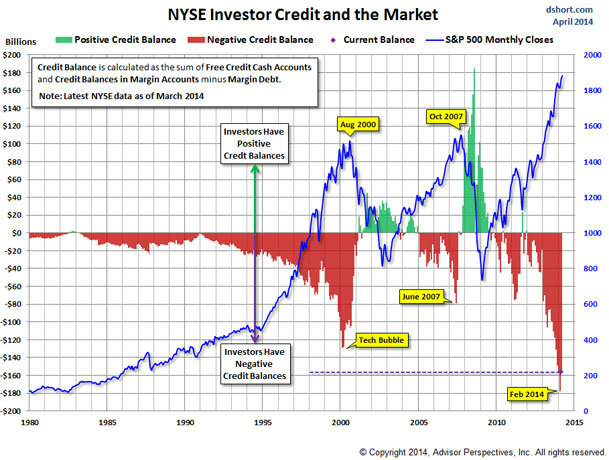 As a result, margin debt levels are viewed by some as a way of gauging market sentiment. Keen students of behavioural finance may not be too surprised to learn that, over time, margin debt levels have tended to be at their highest just before markets crash while, just before markets take off, investors tend to have net cash in their trading accounts. According to the New York Stock Exchange (NYSE), which publishes monthly data on the subject, net debt currently stands at record levels. Now, in theory, investors could borrow money from their brokers and just let it sit in cash and the NYSE would still report that as a build-up of margin debt. To take this possibility out of the equation, therefore, a better way of considering the issue is to look at investors’ ‘free credit balance’, which – put simply – shows how much money they have borrowed specifically to buy shares.